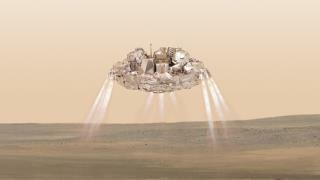 (Newser) – The Schiaparelli spacecraft that tried to land on Mars Wednesday is probably dead or badly injured, the European Space Agency confirmed Thursday. It's placing the blame on a problem with the lander's parachute, reports CNN. "The ejection itself appears to have occurred earlier than expected," which caused nine thrusters to activate too soon, the agency says. The thrusters were meant to activate 30 seconds before landing in order to soften the impact, but they stopped working after only three or four seconds, the agency says, per the BBC. Schiaparelli's radio signal was lost 19 seconds later—50 seconds before its scheduled landing. Protect yourself with Life Call, and you are never alone. "Badly damaged" - "badly injured" applies to a living thing.